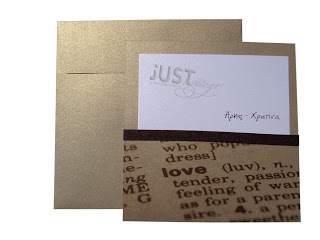 Unique gold pearlized wedding invitations made by an English dictionary pattern pocket style board and a slip with your bespoke invite printed on a white postcard. The matching envelope is square, gold pearlized paper. Your personalized invite is printed in plain brown foil and the design is finished with a brown grosgrain ribbon. Size: 16 x 16 cm. https://www.preciousandpretty.com/2017/10/gold-pearlized-wedding-invitations-A818.html Greek Wedding Favors|Orthodox Crowns|Stefana|Baptism Invitations Gold pearlized wedding invitations A818 Gold pearlized wedding invitations with an English dictionary pattern pocket envelope. Product #: Greek Wedding Favors|Orthodox Crowns|Stefana|Baptism Invitations_5685029041222787948 5 stars out of 5 reviews.